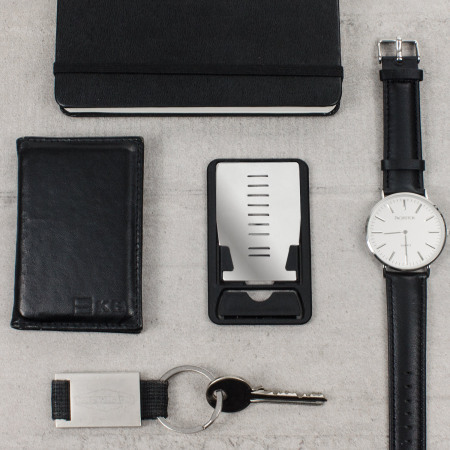 Boasting a lightweight, portable build and a compact size, this ultra-slim credit card-sized desk stand is small enough to fit into a pocket, wallet or purse. 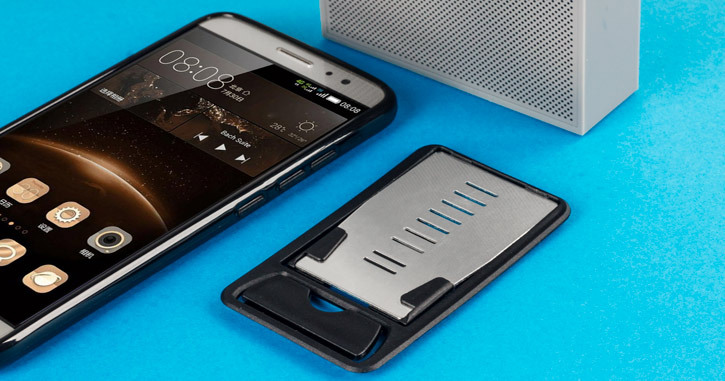 Featuring multiple angles to hold all smartphones big and small. Light, compact cheap simple. 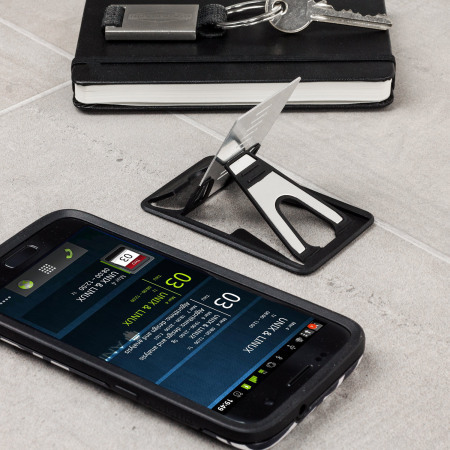 The perfect option for a phone stand on the go when travelling. Keep it in my day pack always. Nothing, its a simple device that is easilly described. 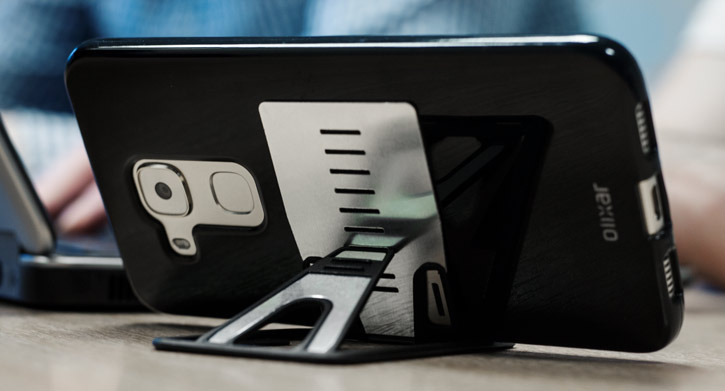 The Olixar Ultra Slim Desk Stand features a convenient adjustable mechanism which allows you to position it in one of five angles ranging from 110° - 135°. By doing so, you can view alerts and messages, watch media, listen to music and browse the web at the perfect angle. 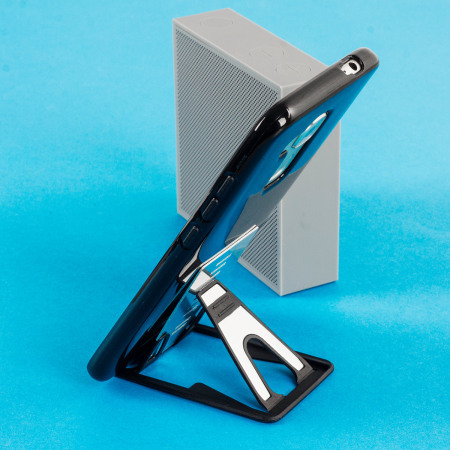 Carry the Olixar Ultra Slim Desk Stand anywhere with you thanks to a super-lightweight and compact build. 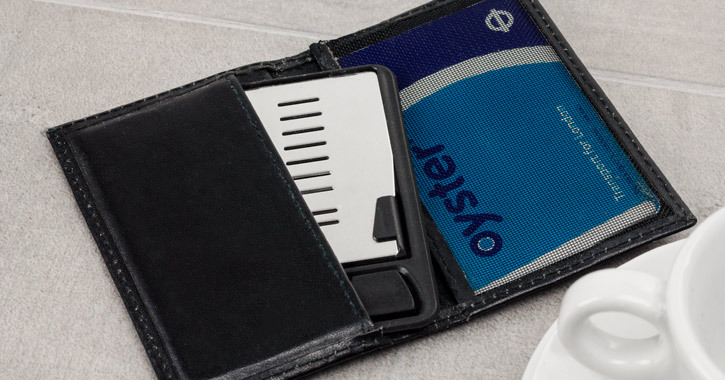 This handy stand is no bigger than a credit card and adds absolutely no extra bulk to any pocket, wallet, backpack or any other storage method - ideal for travelling anywhere and everywhere. 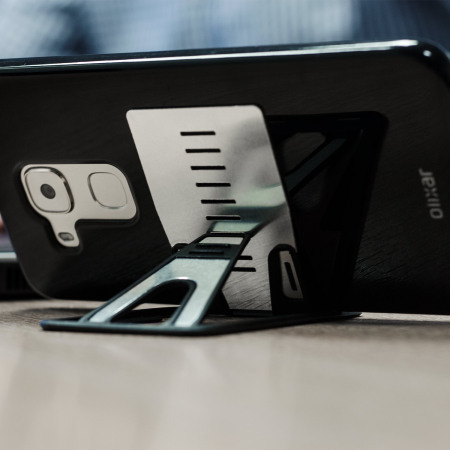 Designed to hold your phone at the perfect angle, the Olixar Ultra Slim Multi-Angle Desk Stand is compatible with most smartphones, letting you view your phone at the most comfortable position. 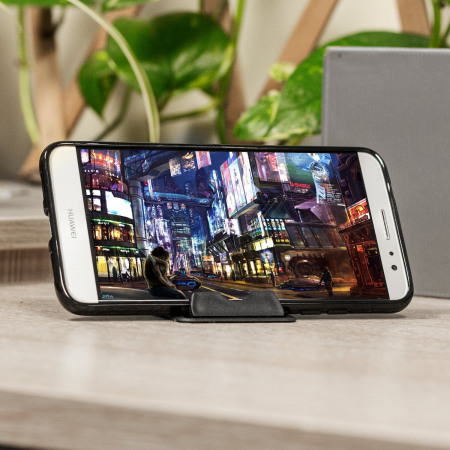 Thanks to a shield mechanism built in to the front of the Ultra Slim Desk Stand, your phone will be held securely and safely in place at all times while mounted on the stand - no matter what viewing angle you choose. Ideal for long sessions watching YouTube or talking to friends via FaceTime, for example. 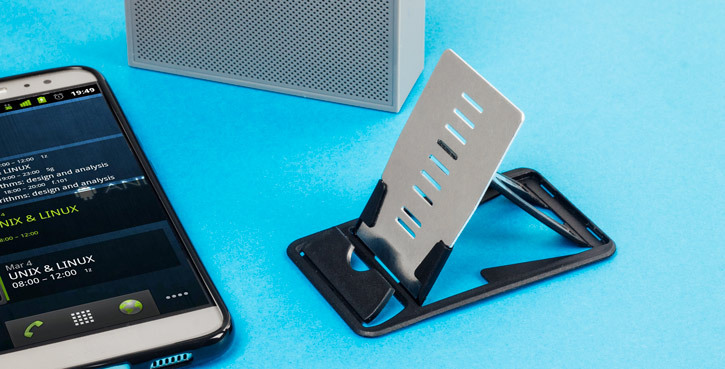 Fit for various purposes, this smartphone stand can accommodate phones in both landscape and portrait positions. This makes it perfect when using your phone as an alarm clock or when viewing photos or videos. The Olixar Portable Multi-Angle Desk features a unique fold away mechanism and weighs an astonishing 10 grams. 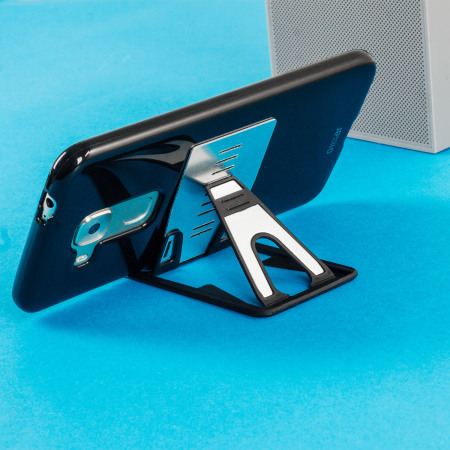 With its user-friendly folding design, this smartphone stand can be folded perfectly flat which makes it a perfect travel accessory. Furthermore, being extremely lightweight and compact, it will also fit into your bag or pocket, without adding any unnecessary bulk. 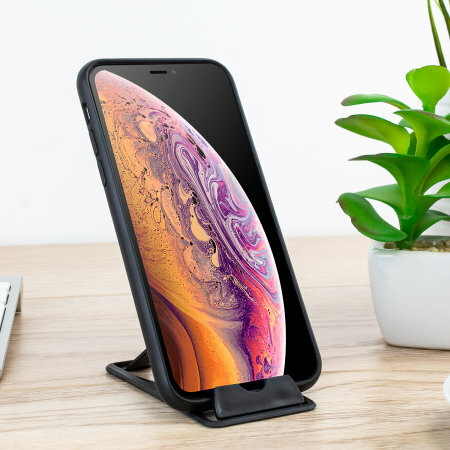 The Multi-Angle Desk Stand will allow you to use the stand with most slim smartphone cases, so you can now position your phone and protect it at the same time, with this case friendly design.